Bruce Butler posted on the Magazine Facebook page, the following image of the badge and his comments which I've included below and have posted, separately the TV interview Howard gave. 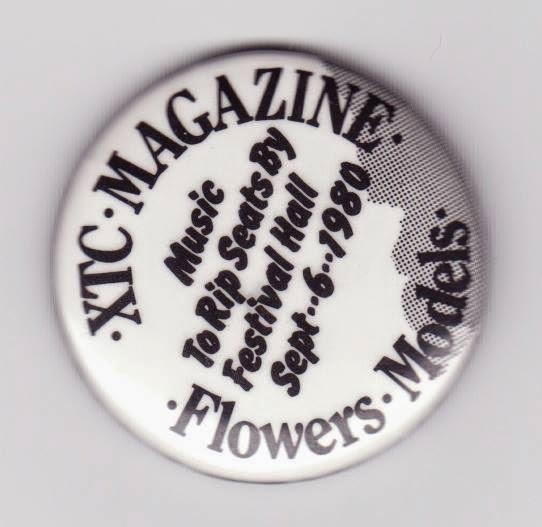 The Festival Hall concert was a double bill with XTC and Magazine supported by local bands Models and Flowers (later Icehouse). I know both XTC and Magazine's entire sets were filmed and recorded. The XTC set has done the rounds as a bootleg but I've never seen the entire Magazine set, only the five tracks released on the 'Nightmoves' DVD. When the 'Play. +' CD was released and I heard it was to be two discs I had hoped the second disc would be the DVD of the same show. A shame and a missed opportunity that it wasn't. Maybe Magazine can give us an idea if the video will ever see the light of day. Meanwhile, here is the promotional badge for this event. There were also sweat-shirts, one of which is being worn by John Peters in the above interview.